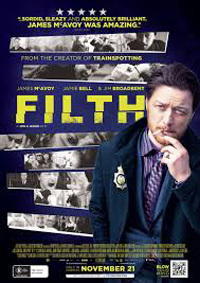 I’m surprised not more of Irvine Welsh’s dark Scottish underbelly novels have been adapted for the screen (Trainspotting being the first and most prominent). Here, as in that ground-breaking movie, our protagonist (Bruce Robertson) also addresses the audience directly, proudly professing his life philosophy as we’re taken on his selfish ride of alcohol and drug abuse, sexual depravity and madness – oh, and he’s a cop(!). Gunning for a promotion (while investigating a Japanese student’s murder), Bruce connives and sabotages his fellow colleagues also up for the job, and treats his friends with total disrespect. While he has an inherent nasty streak, we get to see hints of his humanity and uncover traces of his past (near and distant) that may be a contributing factor to his utter assholism. Besides his filthy real life activity, Bruce also falls into animalistic hallucinations and lives through bizarre perceptions of his pill-prescribing doctor / psychiatrist visits as his downward spiral escalates. But in true Welsh fashion, this is all entwined in a pitch-black humour wrapper, driven by a manic pace and audacious approach, making for an energetic and sometimes jaw-dropping experience. If you enjoyed Trainspotting, rack this up on your watch-soon list.